Secure platform. Entrance to the platform and exit in one click. Network Monitor. Shows a list of programs that have access to the Internet at the current time. Database threats (malicious or unwanted programs). Available for replenishing by the user. Driver Monitor. Shows a list of active and hidden drivers in the operating system. System processes. Provides information about the processes (running programs) that occur on your computer. Service system. Used to display the list of running services. Hidden services and analysis services. Allows you to analyze the svchost.exe file. Monitor hidden processes. This is a special function that is used to detect and display the list of hidden processes (rootkits). Internal protection mode. There are three modes of protection to control running applications within the platform. The login ID in the platform to create multiple platforms protection. The scale of CPU usage. The scale of loading the platform. Scale of loading the clipboard. Selection of interface languages (English, Italian, German, Czech). Emergency exit from the program and all platforms and closing all applications. Screenshot of registration window with the definition of the parameters of the hardware, where COVERT Pro is installed. Designed to protect the user from losing registration details and obtaining a new registration key free of charge. Adjusting the speaker volume and microphone inside a secure platform. Allows you to lock the microphone in order to protect from the listening room where the computer is located. New! “Secure messenger” allows users to exchange encrypted messages without logins and passwords. New! “Monitor DLL” displays the list of loaded DLL when COVERT Pro is running. Supports five languages: English, German, Italian, Czech and Russian. COVERT Pro normally cost $42 for purchase. As part of promotional, now everyone has chance to grab free license key of COVERT Pro without any cost. 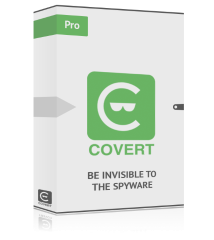 Download COVERT Pro program from HERE. Install and activate the program in the “registration” menu, by clicking the “Register” button. COVERT Pro compatible with all other antivirus programs and supported Windows XP, Vista, 7, 8, 8.1, and Windows 10.